Dimensions (inches): broadside: 21" x 28.5", frame: 32" x 39.25" x 2.5"
5 HEAD OF HORSES, Two thereof single line leaders, coming 6 years old. Three are sorrel driving horses, family broke, ranging in age from 6 to 15 years. 3 GOOD MILCH COWS, Two thereof will be fresh by the day of the sale. 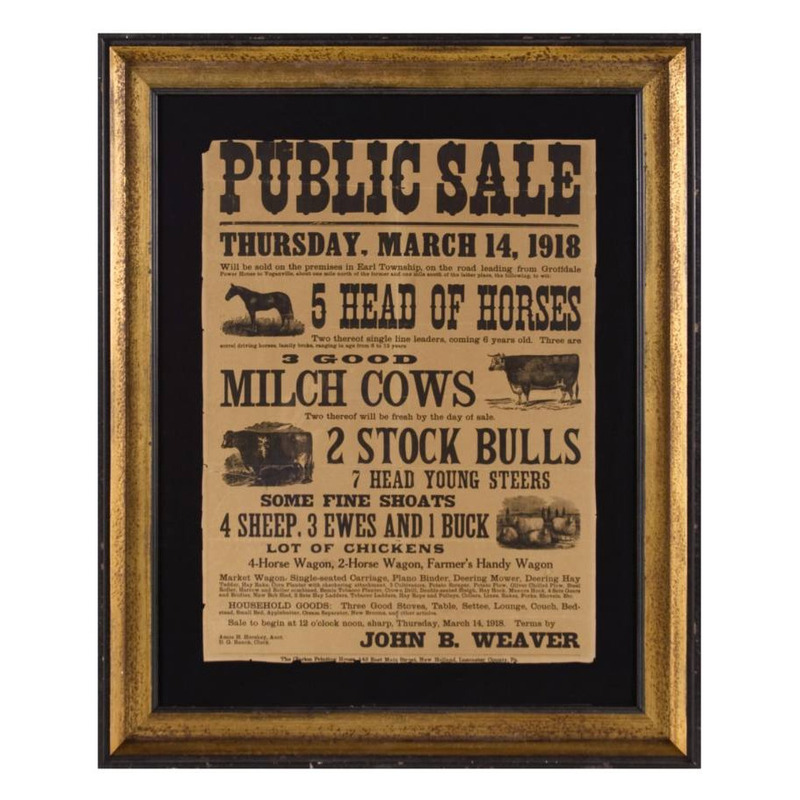 2 STOCK BULLS, 7 HEAD YOUNG STEERS, SOME FINE SHOATS, 4 SHEEP, 3 EWES AND 1 BUCK, LOT OF CHICKENS, 4-Horse Wagon, 2-Horse Wagon, Farmer's Handy Wagon, Market Wagon, Single-seated Carriage, Plano Binder, Deering Mower, Deering Hay Tedder, Hay Rake, Corn Planter with checkering attachment, 3 Cultivators, Potato Scraper, Potato Plow, Oliver Chilled Plow, Steel Roller, Harrow and Roller combined, Bemia Tobacco Planter, Crown Drill, Double-seated Sleigh, Hay Hook, Manure Hook, 4 Sets Gears and Bridles, New Bob Sled, 2 Sets Hay Ladders, Tobacco Ladders, Hay Rope and Pulleys, Collars, Lines, Rakes, Forks, Shovels, Etc. HOUSEHOLD GOODS: Three Good Stoves, Table, Settee, Lounge, Couch, Bed-stead, Small Bed, Applebutter, Cream Separator, New Brooms, and other articles. 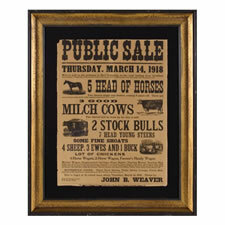 Sale to begin at 12 o'clock noon, sharp, Thursday, March 14, 1918. Terms by JOHN B. WEAVER, Amos. H. Hershey, Auct., D.G. 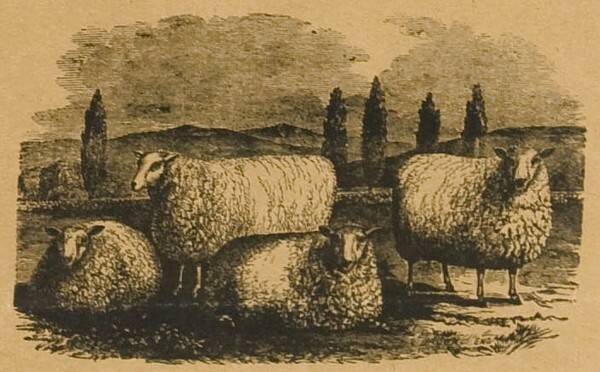 Ranck, Clerk. The Clarion Printing House, 143 E. Main Street, New Holland, Lancaster County, Pa. Mounting: This is a sandwich mount between 100% cotton, black in color, and U.V. protective acrylic. The black fabric was washed to reduce excess dye. An acid-free agent was added to the wash to further set the dye and the fabric was heat-treated for the same purpose. 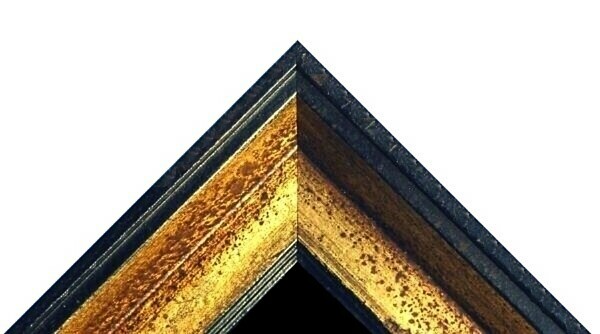 The mount was then paced in a black-painted, hand-gilded and distressed Italian molding. Condition: There is even toning throughout, accompanied by edge wear with associated losses and minor fold marks with very minor holes.